Have you ever seen a bathroom without a mirror? Yeah, me neither. The mirror is a bathroom essential that is as equally functional as it makes the space look more appealing. 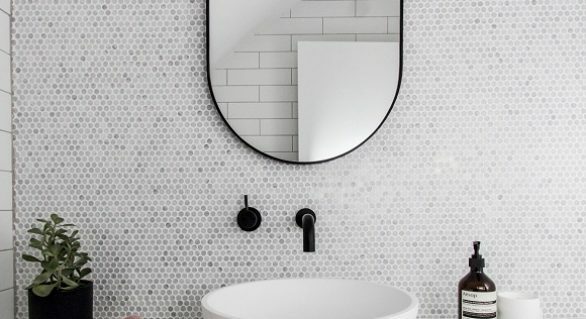 Along with playing a crucial part in your morning and nightly rituals and helping you ensure you look your best, a unique mirror can bring a stylish flair to your bathroom. They come in all shapes and sizes, in a variety of materials and designs ranging from French Provincial to Scandinavian – which means you can easily find a piece that complements your bathroom’s style. 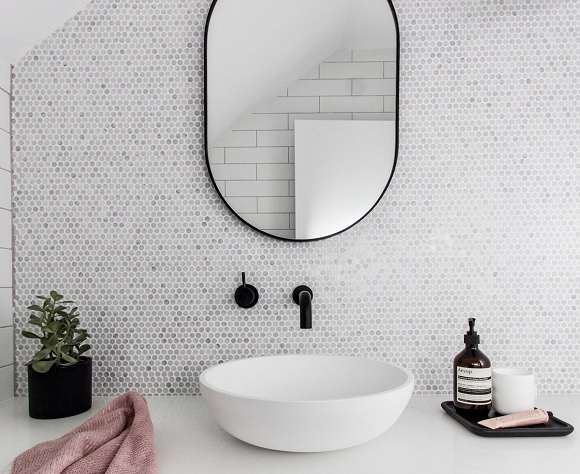 When you decide to buy bathroom mirror, you should know the answers to a couple of questions to choose the best one for your needs: ”Do I want it to be attached to a medicine cabinet? 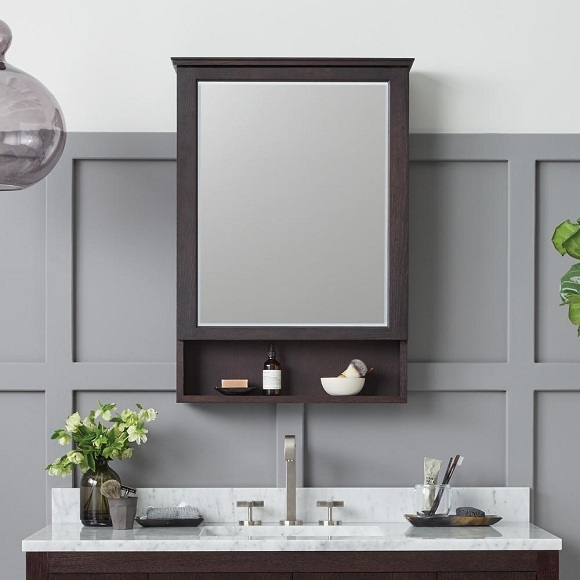 Do I need the extra storage, or do I prefer the sleek, clean-lined look of the mirror without anything else on it?” Truth is, unlike bathroom mirrors (the significance of which is universally acknowledged), not everyone actually needs to have a medicine cabinet in their bathroom. If you already have a vanity with drawers or other bathroom storage units, you probably won’t need one. Especially if your bathroom is tiny and you can’t allow yourself to waste valuable space on a medicine cabinet. If your small space is really a concern, it might be better to buy bathroom mirror that’s a bit larger. A big-scale, yet minimalistic mirror above your vanity can visually enlarge the space, and help distribute light throughout the room. 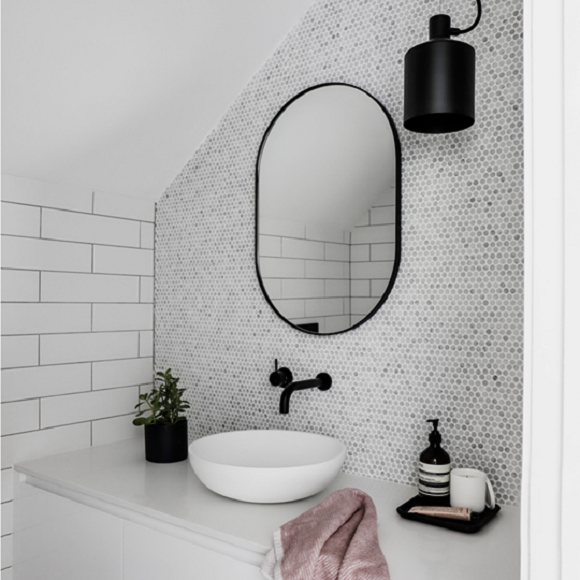 What’s more, creatively framed large mirrors with slim profiles can make the space look much more modern and elegant – a great plus when Scandinavian and all other minimalistic bathrooms are concerned. But if your vanity storage is simply not enough for all the items and products you use on a daily basis, you can make your mirror space work harder by incorporating a medicine cabinet. If you’re worried that it will ruin your sleek bathroom design or that you’ll hit your head on it when bent over the sink to wash your teeth, there’s always the possibility to have it built into the wall. This way it won’t stick out hideously, and your bathroom will have an undisturbed look. Besides being practical, medicine cabinets can be decorative as well. The level of detail can add an eye-catchy accent or help keep the space clean and minimalist. A sloped finish on the edge of the mirror adds a subtle accent to the medicine cabinet while enhancing the mirror with a polished elegance. You can also keep your mirror frameless if you like crisp lines and precise angles.